The hospitality industry is a broad category under the services industry spanning across multiple businesses and sectors driven by the ultimate focus of customer satisfaction. Hotels and restaurants form just one of the many sectors of this industry and constitute a major segment. Other prominent, overlapping, categories include the food and beverages sector and the travel and tourism industry. The smart hospitality market is shaped by a plethora of trends. While some are ephemeral, others leave a lasting impact for several decades. The use of technology is understood to be a key enabler in offering personalized and tailor customer services in almost all facets of the industry, with its defining impact increasingly felt on hotels worldwide. In recent years, spending on technology has soared with the objective of transforming customer experiences, maximizing revenue, and increasing bottom-line. The spiraling investment in a host of technologies such as IoT, virtual reality, beacon technologies, interactive displays, smart control apps, robotics, new generation messaging technologies and streaming in-room entertainment have brought smart services into the realm of the hospitality industry. The increasing implementation of various technologies has been a game-changing strategy for many industry players and has catapulted customers’ convenience to the next level. Guests enjoy the convenience of unlocking their rooms or getting access to numerous hotel facilities such as spa and gym using smart phone apps. Streaming videos on demand are slowly replacing pay-per-view entertainment in hotels. 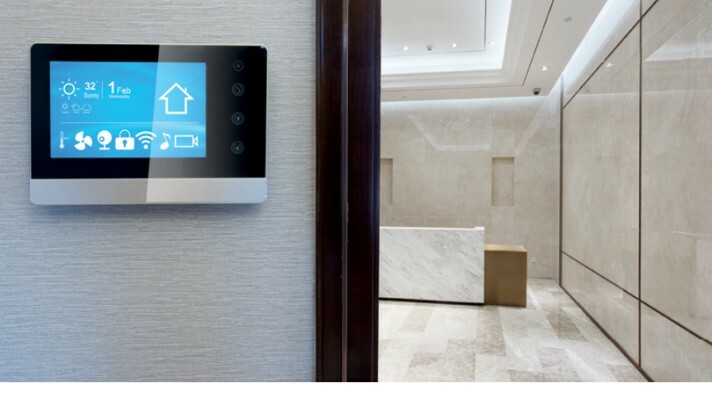 They can use smart devices to remotely control a wide range of functionalities such as lighting system, electrical appliances, blinds, and temperature in their rooms. On the other hand hotel owners will leverage the advantage of intelligences and analytics technologies to gain a strategic insights into their guests’ preferences. As a result, hotels will be able to estimate occupancy with accuracy, manage optimal pricing for the rooms, and provide tailor made experiences, all with an aim to augment their revenue. The hospitality industry comprises services such as cruise line, transportation, theme parks, event planning, lodging, and other different fields in the tourism industry. The hospitality industry is known for being a multibillion dollar industry that solely relies on the obtainability of disposable income and leisure time. A hospitality component such as an amusement park, hotel, or restaurant includes multiple units such as direct operation, human resources, marketing, management, bartenders, kitchen workers, porters, housekeepers, and servers and facility maintenance staff. The most crucial variable for the hospitaliity ndustry is the inverse vacancy rate or usage rate. Theme parks, hotels, and restaurants strive to maximize their profit by expanding their customer base. This gave rise to services with a focus on increasing the use rate provided by the hotel consolidators. Focusing on various other industries, entry barriers for new players and competitive advantages among the existing players is crucial. The hospitality industry seeks benefits in old locations, ongoing and initial investment support and specific themes implemented by the marketing team of the respective organization in question. The market intelligence publication delves into the possible growth opportunities for the global smart hospitality market and the chronological growth of the market throughout the forecasted period. It also uniquely provisions required data related to facers such as the dynamics influencing the progress in all possible retrospective manners. Several ubiquitous and non-ubiquitous trends have also been mentioned in the study. An outlook of extensive nature, keeping in mind the Porter’s five forces analysis, has been provided to make the vendor landscape transparent to the reader. The report further reaches out to point out accomplishments related to R&D, acquisitions, mergers, and crucial partnerships and verifications. The companies in the imelight have been analyzed on market shares, products, and key strategies. The global market for smart hospitality is likely to witness tremendous growth during the respective forecast period. The facets driving the growth of the market include rise in the demand for software and services related to smart hospitality and mounting requirement for real-time optimized guest experience management system. The market is also likely to experience profitability from the low operating costs and captivating revenue generation. The segment of managed services is anticipated to grow a strong CAGR over the forecast period. Managed services provision the application of smart hospitality solutions through hotels and resorts. The guest service management system segment is likely to expand at a strong CAGR owing to the progress in digitization worldwide. Smart solutions help the administrator in controlling the guest room by automating the curtains, lights, temperature, and various other indoor machineries while monitoring the safety and security of the infrastructure and handling the outdoor components such as water management, parking premises, inventory, waste management, and network infrastructure. Business hotels are expected to witness substantial growth in the next couple of years. Business hotels chiefly attend to business travelers; nevertheless, individual tourists, numerous tour groups, and small conference crowds consider these hotels striking. Business hotels deliver their guests with united communication competences that allow the guests to conduct conferences, meetings, and connect with associates across the globe. Additionally, these hotels position various building automation systems and mobile device-enabled technologies in order to provide an enthralling experience to the visitors.